Fixies gear up the origins of cycling. 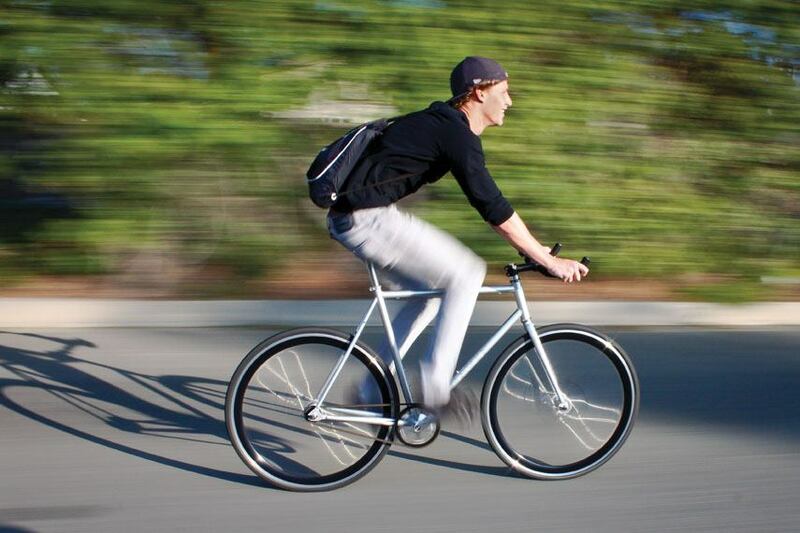 Rallying through La Verne’s city streets, sophomore Colin Wheatly takes six minutes to drive to the University from home, and only seven minutes to ride his “fixie,” making the ride fun, efficient, and economical. Your first bicycle. In your memory, it was probably a single speed, metal fender, brightly painted, kickstand supported marvel. Perhaps the only way to brake was pedaling backwards. Then, the magic of bicycling opened up with technologically advanced hand shifters coupled with hand brakes. The mechanical advantage of multiple gearing made it so the pedals did not stay in rotation with the back wheel. You had conquered gravity. But wait…advanced cyclists are returning to the first bike under the Christmas tree, minus the training wheels. Single geared bicycles are making a revolutionary come back in the biking community. These fixed gear bicycles or “fixies” as they are called, are becoming the hot item for gung-ho cyclists to add to their bike fleet. It is all very Zen-like with the pedals in constant motion and a feeling of bike oneness. But before making the purchase, consider this: “Compared to a road or mountain bike, it is the worst bike you could own. You have limited speed, limited climb, limited everything, no brakes, and it’s completely unsafe. A fixed gear bike by far is for the rider looking for fun and thrill seeking,” says University of La Verne Cycling Club president and fixie rider Vince Gonzales. Because a fixie has only one gear, no brakes and is intimately linked to the strength and coordination of the rider, yes, it is difficult to ride. But to those who master them, it is bicycling in its raw essence. 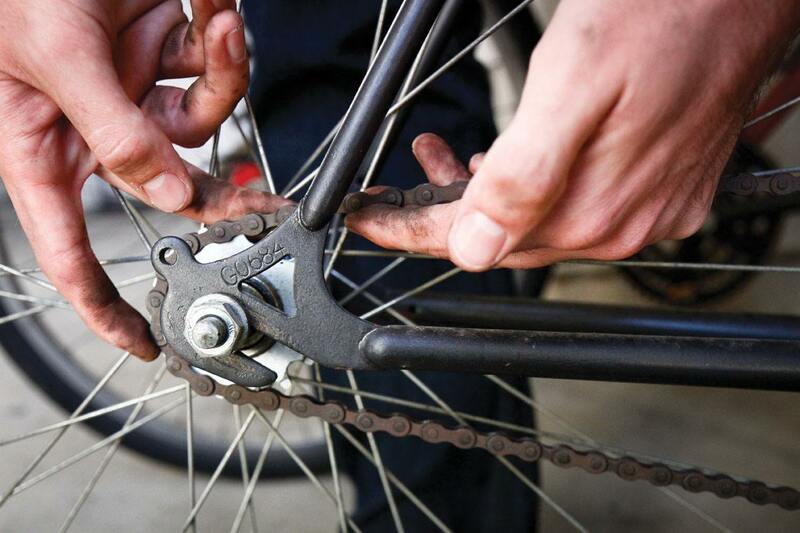 On a fixed gear bicycle, the sprocket is directly screwed to the hub. The hub is the centerpiece, the core of the sport. “The difference between a regular bike and a fixie is that when you are riding a fixie you don’t have any options of brakes or anything; legs control whatever you do,” says Mitchell Aleman, fixed gear bicycle rider and University of La Verne student. “So you can manage your speed; you can go slower or faster whenever you want just based off how you move your legs. There is a real sense of agreement between you and the bike.” With this bike, the challenges become the ownership piéce de résistance. “The biggest obstacle a rider would have to overcome is the fact that the pedals don’t stop moving, and that some of them don’t come with any brakes,” says William Sullivan, sales associate at Incycle in San Dimas, who is also a ULV student. “The coordination there is definitely a big obstacle to overcome.” A traditional geared bicycle allows the rider to coast. When a fixie is in motion, the back wheel is rotating the pedals. Therefore, fixie cyclists cannot coast and are in constant motion with their bicycle’s forward speed. This takes some training. “It does take time, but it feels more natural once you get used to it,” Mitchell says. Before the derailleur, the first bicycles, including the racers, had only one gear. A derailleur is the transmission system for a bicycle; it assists the bicycle chain when it moves from one sprocket to the next. Climbs and descents are easier to control with the correct available gearing. Modern bikes can support more than 30 gear combinations. In essence, a fixed gear bicycle is an old simple bicycle. “They were originally used as velodrome race bikes so they are sometimes called velodrome track bikes, track bikes, or single speeds,” Mitchell says. Sometimes fixed gear bicycles will come with a supplemental braking system. However, for the purest, they do not have brakes. The stopping is unique—a cyclist might skillfully fish tail when stopping. Fixie riders call this “drifting” or “sliding.” The linkage of rider to bike allows majestic tricks to be pulled off, including dance routines. Simple tricks include front and rear wheelies. The more complicated tricks turn into a magic act. Riders sometimes keep the front wheel planted on the ground and make the handlebars do a full rotation called a bar spin. More complicated moves happen when they are in motion. While keeping the bicycle balanced, riders and their bicycles become one. They sometimes put a leg over the front handlebars and stretch their bodies into an arch position. The most daring riders take both hands off the handlebars. A fixed gear bicycle is also known for its unique look. At Incycle, “The best brand we have in stock is either the Schwinn or Specialized. I think the best fixed gear is the one that you actually create, mainly because there are so many personalities you can add. Plus it makes it cool that you did it yourself,” William says. Each fixie is different; there are not many duplicates. All are distinctive and have a variety of styles to suit personal preferences, whether it is color, frame or distinctive handlebars. The brand choices allow riders to customize. Republic Bike invites buyers to create fixed gear bikes on its website, with 3D image feedback. A good entry level fixie costs about $300. Nevertheless, with serious customizing, the cost can reach an average of $500 to $600. 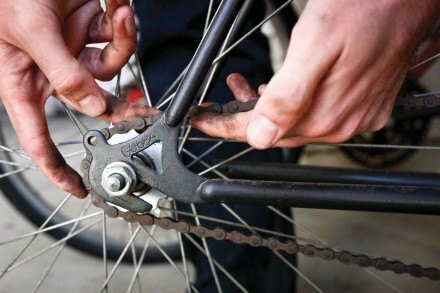 Fixed gear bicycles require little maintenance, having no brakes or chain derailleurs; nevertheless, checking chain tension is important. ULV sophomore James Cano makes wheel adjustments before his five-mile ride home. “Fixed gear bikes date back all the way to the velodrome,” says Vince Gonzales, ULV Cycling Club president. The velodrome is an arena for track cycling, a semi oval with high bank turns. The first recognized United States race came in 1879 at Madison Square Garden in New York City. And the first racers had fixed gear bicycles. The most popular and well-known event in the late 19th century was the one-hour race where riders would put their bodies to the limit for an hour, going as fast as they could, trying to gain the best times. The velodrome remains a popular Olympic event. Today, the most prestigious world cycling race is the Tour de France. During that first tour in 1903, 60 competitors from five European countries entered and started before sunrise so they could complete the stage with daylight. The fixed gear bicycle was used in those first Tours. And it was this famous race that spurred technology advances. Now, the 20-stage, 2,161-mile race across the French countryside is undertaken with technically advanced road bicycles. Great article, i could really feel the love you have for cycling. thanks for sharing!